I was contacted by a reporter to comment on the apparently radical difference between different seasonal forecasts that are currently available for the upcoming winter here in the northeast. The private company AccuWeather predicts a cold winter for us, while the Climate Prediction Center, a US government facility under the National Oceanic and Atmospheric Administration (NOAA) predicts that a warm winter is more likely. This post is an expanded version of the comments I wrote to him by email. Here is the map showing the current AccuWeather forecast for this winter. The map is accompanied by an article stating the forecast in words. It begins: “Though parts of the Northeast and mid-Atlantic had a gradual introduction to fall, winter will arrive without delay. Cold air and high snow amounts will define the season.” Those are confident statements, with no expression of uncertainty. The rest of the article is the same. Here is a map showing NOAA’s temperature forecast for December through February in graphic form. (Original link here). It shows warm for the northeast, where AccuWeather showed cold. But I am not really interested in that difference. The more important difference is that NOAA’s map shows probabilities. The NOAA map states the forecast in terms of the probability that the temperature will be normal, above normal, or below normal. These are defined as terciles, or ranges capturing 1/3 of the historical data – 1/3 of all winters have been in each range. Thus if we had no other information (no current weather data, no forecast models, etc. ), we would say there are equal chances of above normal, normal, or below normal – the chance for each would be 33%. Areas where this is the case in NOAA’s judgment are shown as white on the map. Red means the chance of above normal is significantly greater than that for below normal, blue means vice versa. The probabilities for either above or below are nowhere much greater than about 50%, meaning that even where it’s red, for example – meaning warm is more likely – there is still a significant chance of cold. In other words, the forecast is uncertain. Here is a USA Today article with some statements from NOAA CPC Acting Director Mike Halpert, expressing that uncertainty in words. The current state of the science is such that seasonal forecasts such as these have only a modest amount of skill, even in the parts of the world where they are the best. That means if you were to bet on them every season for many years, you would make money in the net, but not a lot. The tercile probabilities, with their modest departures from 33%, communicate that. So a confident forecast that a cold winter (or a warm one) will occur, with no statement of uncertainty or probabilities – such as AccuWeather’s – gives an exaggerated and misleading impression of the degree of certainty that is possible. The NOAA forecast is truer to the science, in that it is stated in terms of probabilities, and does not express a high degree of confidence in any one outcome. 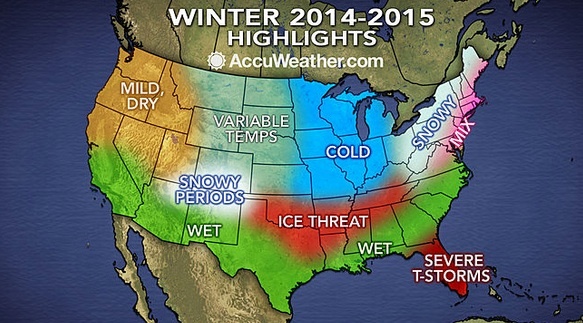 That doesn’t mean it won’t be a cold winter, as AccuWeather says; it might be. It just means there is no way of being anywhere near as certain as their forecast implies. That said, AccuWeather may be taking their cue from our normal daily weather forecasts (including those from NOAA, of which the National Weather Service is a part). Those too, really, should also be stated in terms of probabilities, but are not. (Actually, they are, for precipitation, e.g., 50% chance of rain, but not for temperature.) So perhaps AccuWeather thinks people are more comfortable with deterministic forecasts, and thus choose to provide deterministic seasonal forecasts as well, even though they know (I have to assume they know) they will be wrong a good fraction of the time. I think that is unwise, given the low skill of seasonal forecasts in particular; it gives the public the wrong idea about the nature of the information they are being given. I believe most people are capable of understanding basic probabilities, and would be better served by forecasts stated in those terms. I have not addressed why AccuWeather is going cold for the northeast while NOAA is going warm. I don’t know the answer to that. I am pretty sure they have access to most or all of the same information and just interpret it differently. But in my view it would be misleading to focus on this difference. The more important point is that both forecasts are uncertain, and should rightly be expressed in terms of slight changes in the probabilities. NOAA does express it this way, while AccuWeather doesn’t. Finally: without looking at any weather data or models, one can say pretty confidently that it is very unlikely that this winter will be as cold as last winter was in the eastern US. Last winter was very extreme by historical standards, so a winter that extreme is – basically by definition – improbable in *any* year. No information currently available (including the state of El Nino), or that will be available ahead of time, is strong enough to change that. Again this is a probabilistic statement: it’s not impossible that this winter will be as cold or colder than last, it’s just very unlikely.